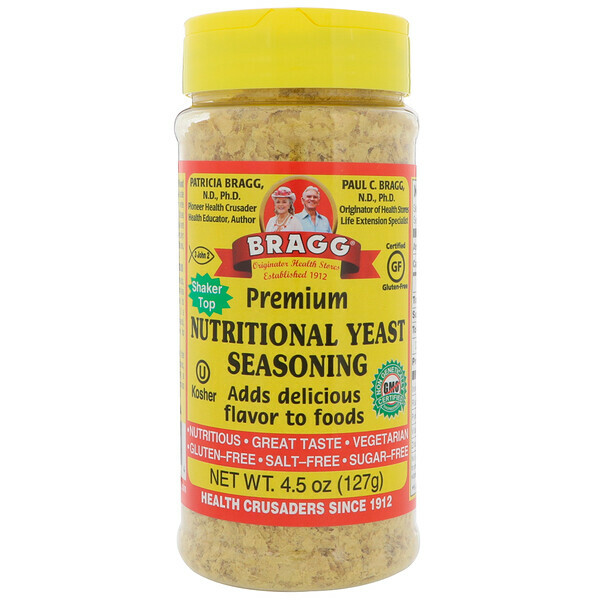 Bragg Premium Nutritional Yeast Seasoning provides great-taste and nutrition when added to wide variety foods and recipes. 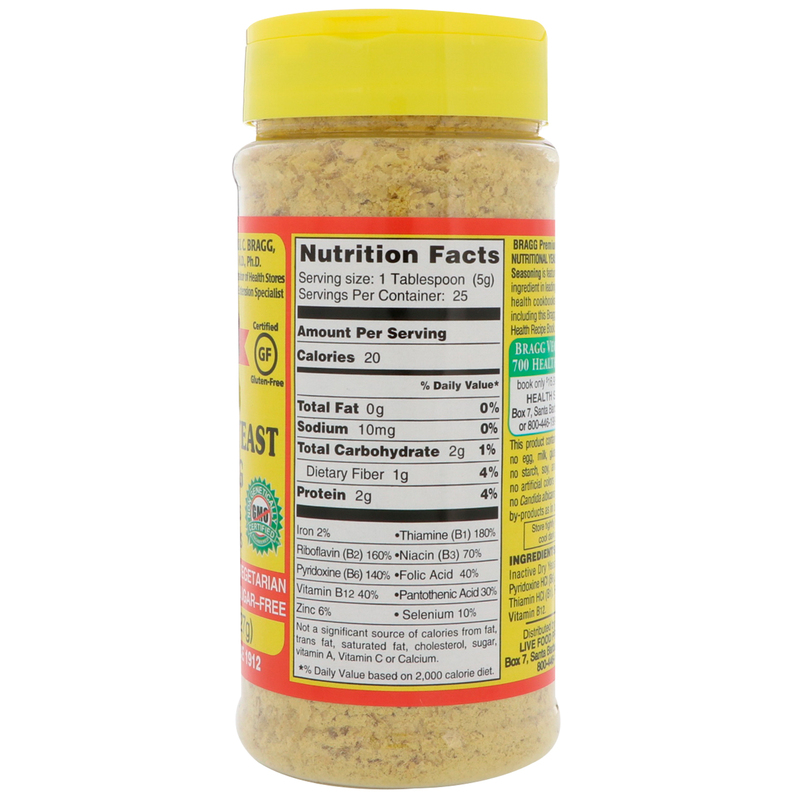 Makes a healthy, delicious seasoning when sprinkled on most foods, especially: salads, vegetables, soups, potatoes, rice, pasta and even popcorn! Specific design to help meet the nutritional needs of vegetarians, vegans and anyone wanting a good source of B-complex vitamins (including natural vitamin B12). 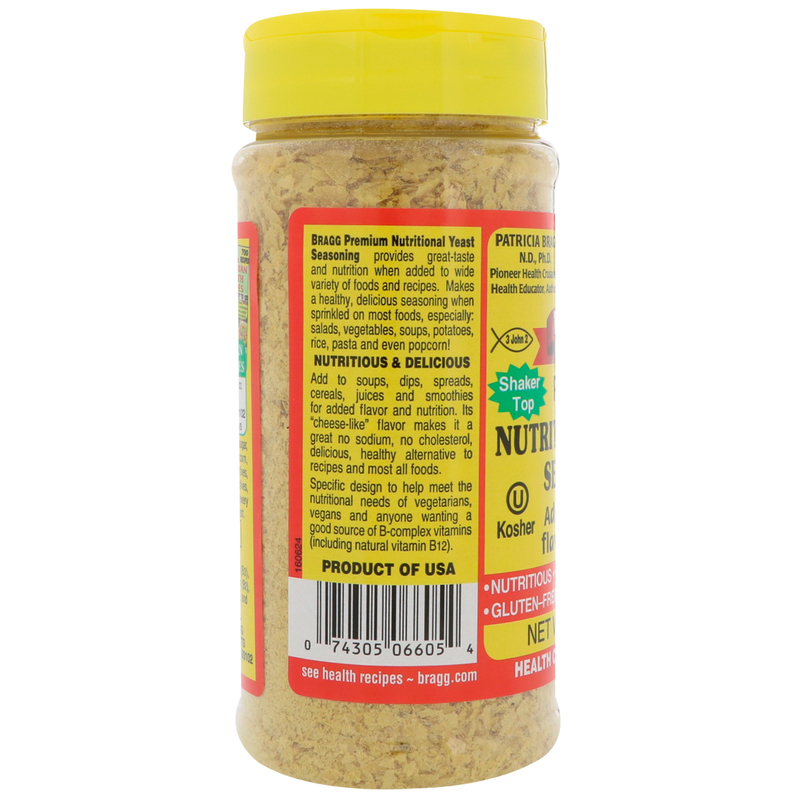 Add to soups, dips, spreads, cereals, juices and smoothies for added flavor and nutrition. Its "cheese-like" flavor makes it a great no sodium, no cholesterol, delicious, healthy alternative to recipes and most all foods. Inactive dry yeast, niacin (B3), pyridoxine HCI (B6), riboflavin (B2), thiamin HCI (B1), folic acid, and vitamin B12. This product contain no salt, sugar, no egg, milk, gluten, wheat, corn, no starch, soy, animal derivatives, no artificial colors & preservatives, no candida albicans yeast or brewery by-products as in brewer's yeast. Store tightly sealed in cool dark place. Not a significant source of calories from fat, trans fat, saturated fat, cholesterol, sugar, vitamin A, vitamin C or calcium.